Chicken Do Pyaza is one of the most famous punjabi cuisine. "Do" means "two",so this dish requires double quantity of onions as compared to normal chicken curry. 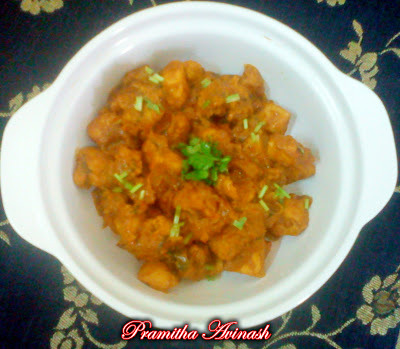 It gives very specific sweet and spicy taste.This is really a wonderful yummy dish.Please do give it a try and let me know how you like it. Recipe source : MyCookingWorld . I made few changes in the quantity of the ingredients. 1.Heat oil/ghee in a pan,add bay leaves then add the finely sliced onion and fry it till golden brown color then add the ginger garlic paste and saute it for 2 minutes. 2.When it is done add the chopped tomatoes and cook until the oil or ghee separates.Now add all the spices and saute it till the raw smell goes. 3.Stir in the yoghurt and add the chicken cubes into it and mix all the ingredients together and saute it for 1minute.Then add a cup of water and cook the chicken. 4.When it is half done,add the cubed onion and cook it until the gravy becomes dry. 5.When it is ready add the lemon juice and stir it.Then garnish with chopped fresh coriander leaves. 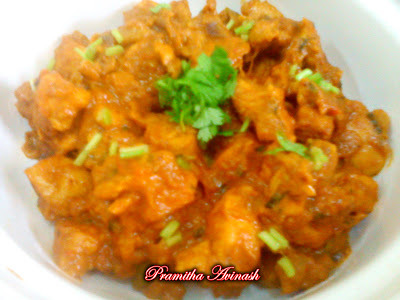 Beautifully done, who can resist to this wonderful and delicious chicken do pyaza.